However, it finds that despite the hoopla around Praveshotsav for getting higher enrolment in schools, the number of students enrolled in government schools went down between 2005-06 and 2010-11. Indeed, the data suggest that government appeared to be more interested in handing over education at the primary level to private hands than taking up the responsibility itself. Data collected and collated by DHRM suggest that in 2004-05, there were 32,258 government schools, in which 59,63,898 students were admitted, which means the proportion of children per school was 184.88; in 765 government aided schools, which are run by private trusts, 1,55,808 students were admitted, and the proportion was 203.67; and in 3,293 private unaided schools, 6,90,433 students were admitted, and the proportion per school was 209.73. In 2010-11, things went drastically in favour of private schools, that too unaided ones, with admission to government schools beating a retreat. While the number of government schools increased to 33,537, they admitted 59,17,835 students, albeit less by one per cent point. The proportion of children per school obviously went down to 176.45. In 788, government aided schools (run by private trusts), 2,14,049 students were admitted, and the ratio reached 271.63. As for the number of private unaided schools, these made a quantum jump to double of what it was six years earlier, to 6,403, and the number of children admitted in them, too, reached 20,13,161, a more than three-fold rise, with the ratio of children admitted reaching 314.40 per school. This is quite an eye-opening factor, for SSA is Government of India’s flagship programme for achieving universalizing elementary education in a time bound manner, as mandated by 86th amendment to the Constitution of India to make available free and compulsory education to the children of 6-14 years age group as their fundamental right. Its overall goals include universal access and retention, bridging of gender and social category gaps in education and enhancement of learning levels of children. SSA is being implemented in partnership with state governments to cover the entire country and address the needs of 192 million children in 1.1 million habitations. The programme seeks to open new schools in those habitations which do not have schooling facilities and strengthen existing school infrastructure through provision of additional class rooms, toilets, drinking water, maintenance grant and school improvement grants. A further breakup of the budget suggests reveals that 95-98 per cent of the allocation made against teachers’ salary-grant is spent, while the expenditure for drop out children remains unspent. Thus, in 2010-11, just about 52.1 per cent of the allocated funds were spent for the intervention required to bring back out of school into the mainstream. Similarly, as for free text books, just about 77.1 per cent of the grants were spent. On both the counts, the study comments, the government’s performance is “unexplainably poor.” Then, the state government spent just about 38.13 per cent of the budget on innovative activity and 57.79 per cent on community mobilization, suggesting the government was not interested in either innovation or mobilizing the community or involving society at large in educational activities. Further, the study says that there has been a very poor response to the special training centres (STCs), put up under SSA in order to bring back the out of school children into the mainstream of primary education. It says, out of total 1, 57,423 students who should be part of STCs, because they were out of school, only 31,986 could be covered, while a whopping 1,10,340 or 70 per cent remained uncovered in 2010-11. “This explains the limitation of SSA”, the study underlines. The study particularly found things bad in Ahmedabad, whose 41 wards with 579 STCs. Of these, as many as 212 STCs, or 36.61 per cent, had no children! The study finds a very poor functioning of the Bal Mitra scheme under which those who are appointed have to work for motivating children to get admission in school and teach them for a monthly honorarium of Rs 2,500 for a B Ed pass candidate and Rs 1,500 for PTC pass-outs. 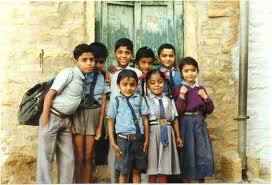 Each one of them is given a target of getting at least 10 children from slums and poor localities to school. The Bal Mitras are recruited on ten month contract. “The system of appointing Bal Mitra is ad-hoc. “Our interaction with Balmitras and subsequent visits of STPs revealed that the functioning of these centres needed monitoring and there are numerous things which are dubious”, the study said. Migration of child labour within and outside Gujarat is tracked by the migration monitoring system is run by SSA, Gujarat. “The intra-state report reveals that within Gujarat a total of 14,031 children have been found as ‘in migrant’ and 25,907 as ‘out migrant’. The Dangs (7,124), Dahod (3,643), Tapi (3,014), Kachchh (1,584), Surat (1,193), Narmada (1,141) and Bhavnagar (1,022) top the list in ‘out-migrant’ category. Out of a total of 25,907 out-migrant children, 12,269 children or 47.35 per cent were untraced”, the study says, adding, “This is serious matter, as it shows chaotic and random nature of monitoring system.” Then, there are inter-state migrants. Out of 26 districts, 11 districts reported zero cases of out-migration to other states. There are in all 394 out-migration cases to other states have been reported, out which the Dangs alone reports 300, all of whom go to neighboring state Maharashtra. “But the migration cards are incomplete. They do not show the location in Maharashtra, where the children would have gone. This shows poor implementation of the Inter-state Migration Act”, the study comments. Whether a child at the Primary level goes to a government school, or government aided school or a private school is not so important because it is for the child’s parents to decide where it should study. The important point is not to see whether more and more children get admitted to primary classes each year but whether the absolute number of children who do not enroll at any school is steadily going down each year. That is whether the number of children who should be in a primary classroom but are not is decreasing steadily each year. This I have not been able to make out from your study.